A very good and very interesting example of Yongzheng period famille rose decoration, this octagonal 8 1/4″ plate features the very popular theme of cockerels in a landscape with the two yellow birds in this particular piece virtually one over the other in a very fore-shortened space bordered to one side by the strong vertical of a leafing tree trunk and a swaying over-sized peony all within a shaped outer border of flowering prunus and peony branches against cell-work diapered ground. All in rich, thick enamels, proud of the surface. Very good condition, a great, fun, vibrant design. Circa 1730-1735. A charming Chinese export porcelain Yongzheng period teapot and cream jug, lavishly decorated in famille rose enamels, with roundels depicting a garden stool and table with a a profusion of peony blossoms, beneath which reclines a white kitten, all against a densely worked ground with a variety of meticulously rendered diapering and scrolling foliate decoration, the cover as richly enameled and surmounted by a gilded foo lion. A very small area on the teapot possibly re-painted with line sealed beneath, otherwise very good condition and superb decoration. The teapot 5″ tall x 6 1/2″, the cream jug 3 1/4″ x 3 3/4″. Priced as a set. Circa 1735. $4900. Typifying the refinement of the Yongzheng period, this lovely Chinese export porcelain teapot and covered creamer are beautifully painted with elegant scenes of a man and a lady conversing in a landscape along with an attendant, delicate foliate gilded borders and flowering branches on the covers completing the design. The teapot measuring 4 1/2″ tall x 6 1/4″ wide, the creamer 4 1/2″ x 3 1/2″. Both in very good condition with the exception of some minor glaze loss on the creamer handle. Priced individually. Circa 1730. A lovely pair of Chinese export porcelain soup plates decorated in famille rose enamels, centered with a scene of a pair of quail beneath branches of flowering prunus, peony and chrysanthemum, the rim painted with further flowering branches and bamboo in biano sopra bianco. Measuring 9″ in diameter and in good condition with the exception of two chips to the reverse of one plate which does not detract from its presentation. Circa 1735. A fantastic example of Chinese export special order armorial porcelain made for the English market, these fine plates are from a service bearing the Arms of Chapman quarterly impaling Wood quarterly with Edmundson in pretence. These elaborate and flamboyantly rendered arms with their Latin motto fill the well of the plate within a gilded spearhead cavetto border, the rim decorated with an understated rendering of elegant flowering peony branches in bianco-sopra-bianco. Services such as these were de rigueur status symbols for the English nobility of the 18th century, advertising their wealth and connections.  Discussed and illustrated in Howard’s Chinese Armorial Porcelain, vol. I, page 411. Measuring 9″ in diameter, and in very good condition. Circa 1740. An especially charming and whimsical Chinese export porcelain wine pot in the form of a cockerel, brilliantly enameled, with his striped tail feathers forming the handle. Measuring 6 3/4″ x 7 1/2″ and with restoration to the feet, beak and nozzle, otherwise good condition and a rare form. First half of the 18th century. A fine pair of Chinese export porcelain barbed edge plates, elaborately decorated in famille rose enamels with a central shaped medallion of peony and prunus against a swirling foliate blue ground, the cavetto with a ring of lotus, and the shaped rim repeating the peony and lotus motif again against a blue ground. All richly enameled, “proud” of the surface. Illustrated in Williamson’s book on superlative examples of early famille rose.Very good condition, measuring 9″ in diameter, and dating to circa 1735-1745. An outstanding example of the fine Yongzheng wares being produced and catering to the demands of the Western market, this handsome armorial charger is from a special order service made for a one time Lord Mayor of London. Bearing the elaborately detailed central arms of MERTINS impaling PECK, it is illustrated and discussed in the venerable tome by David Howard, Chinese Armorial Porcelain, Vol. I, Page 213. In very good condition, 12 1/4″ in diameter and dating to circa 1725. A very fine pair of Yongzheng period Chinese export porcelain ruby ground plates, each centered with a leaf-shaped reserve decorated with a cockerel standing on a rock amongst flowering branches, the rims with smaller leaf reserves with flowering branch and bird and butterfly vignettes, all against a rich ruby enameled ground, a technically very difficult effect to achieve in a kiln firing. One in good condition, 1 with rim line consolidated, both presenting beautifully and measuring 9 7/8″ in diameter. Circa 1735-1740. A very impressive Chinese export porcelain wine cooler, decorated in famille rose enamels with elegant flowering branches, the bulbous form raised upon a flared base and surmounted by a flared monteith style rim, the rim decorated as well on the interior. Heavily potted to support ice and wine for a lavish entertainment, this magnificent piece, modeled after European silver forms, would have been a status symbol in its day, gracing a nobleman’s sideboard, a sign of his gracious and liberal entertaining. Measuring 13″ x 19″ x 16″. With a crack sealed and a chip to one of the monteith lappets restored, otherwise, very good condition. Third quarter of the 18th century.